Weather and Harvest: Soft red winter wheat (SRW) is grown over a wide area of eastern United States. 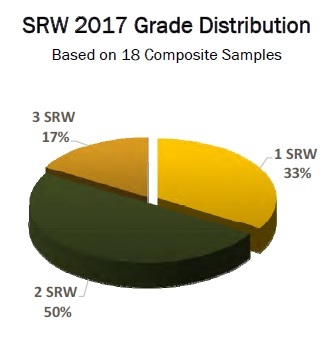 Thearea seeded to SRW in fall 2016 for the 2017 harvest is estimated by USDA at 5.6 million acres (2.3 millionhectares), down from 6.6 million acres (2.7 million hectares) seeded for the 2016 harvest and well below the five-year average SRW planted area. The reduced area is attributed mainly to choices made by growers based on commodity prices. The 2017 SRW production, estimated at 8.3 million metric tons (MMT), is down from 9.4 MMT in 2016 and is well below the five-year average. 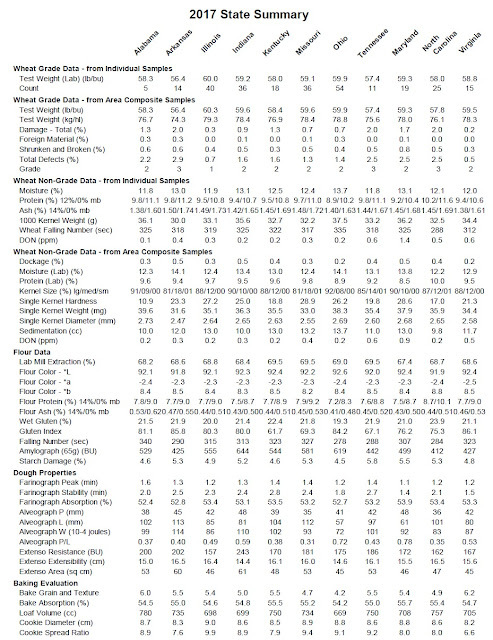 However, USDA estimates that the total SRW supply (excluding imports) for the 2017/18 marketing year is 4% higher than 2016/17 because of higher 2017/18 beginning stocks. Planting proceeded at a slightly slower than normal pace in fall 2016. However, the crop was in good condition by late fall with more than 90% of winter wheat rated fair to excellent in five of the six SRW survey states where wheat crop conditions are reported by USDA. 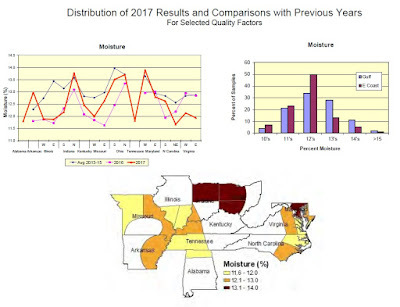 While some of the southeastern SRW area was dry through the winter months, ample rain in March through early June provided adequate moisture for crop development. The beginning of SRW harvest was delayed somewhat by rain, but once started, harvest progressed rapidly. 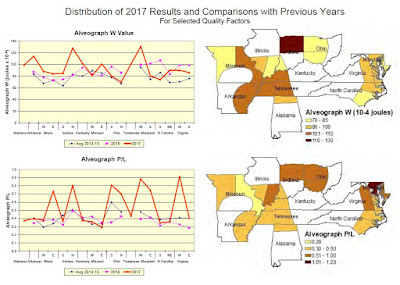 Survey Methods: Sample collection and analysis were conducted by the Great Plains Analytical Laboratory, Kansas City, Missouri. 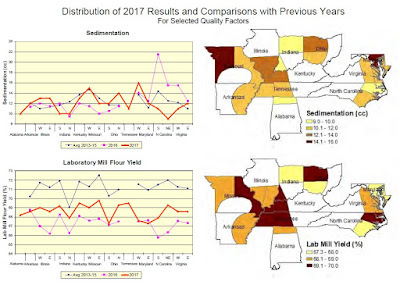 In 2017, 270 samples were collected from elevators in 18 reporting areas across eleven states. 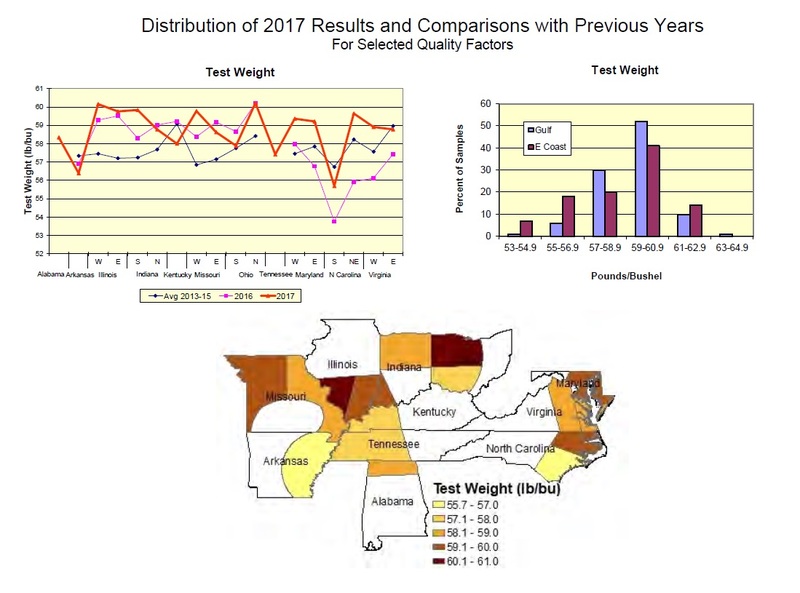 Alabama and Tennessee were surveyed in 2017 for the first time. 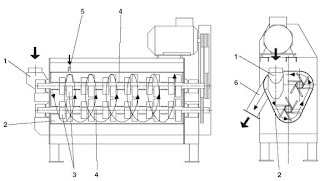 Test weight, moisture, protein, thousand kernel weight, wheat ash and falling number were determined on all individual samples, and the remaining tests were determined on 18 composite samples. 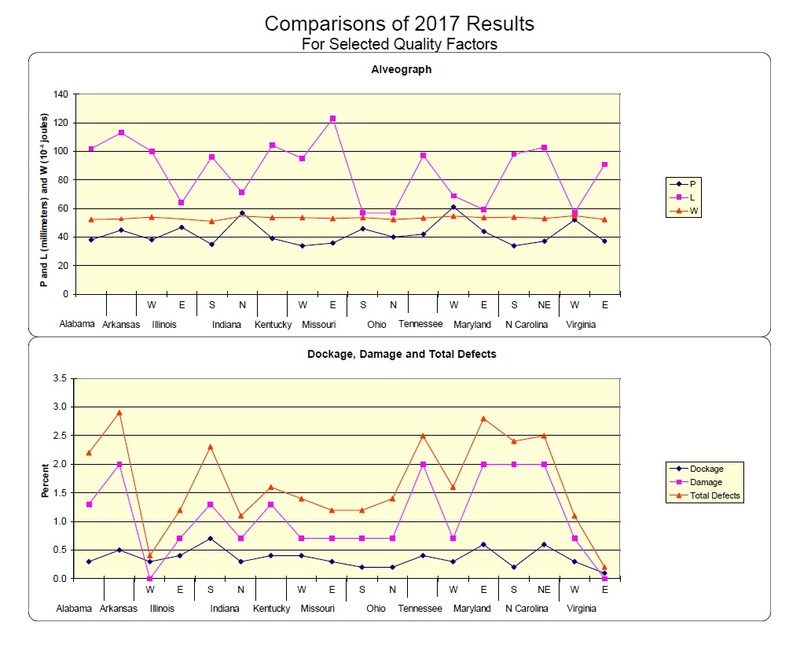 The results were weighted by the estimated production for each reporting area and combined into “Composite Average”, “East Coast” and “Gulf Port” values. 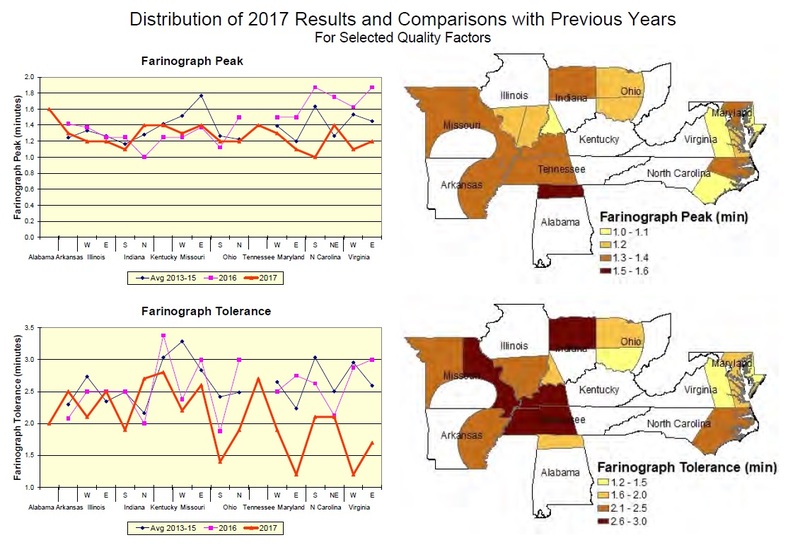 Gulf Port states include Alabama, Arkansas, Illinois, Indiana, Kentucky, Missouri, Ohio, and Tennessee, and accounted for 79% of the 2017 SRW production in the states surveyed. East Coast states include Maryland, North Carolina and Virginia and represent the remaining 21% of production in the states surveyed. 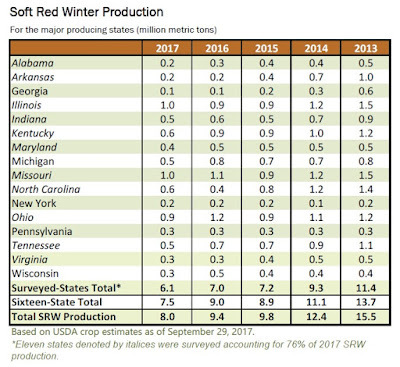 The states surveyed account for an estimated 77% of total 2017 SRW production. Wheat and Grade Data: When analysis results are weighted by estimated state production, the average gradeof all samples collected for the 2017 SRW harvest survey is U.S. No. 2. 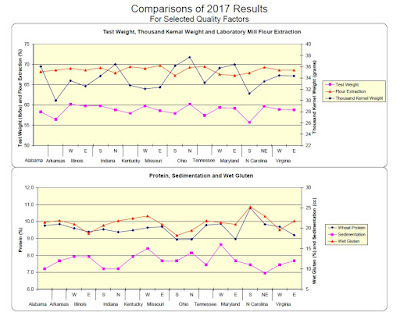 The weighted average test weight is 59.1 lb/bu, above the five-year average and the 58.6 lb/bu average of 2016. 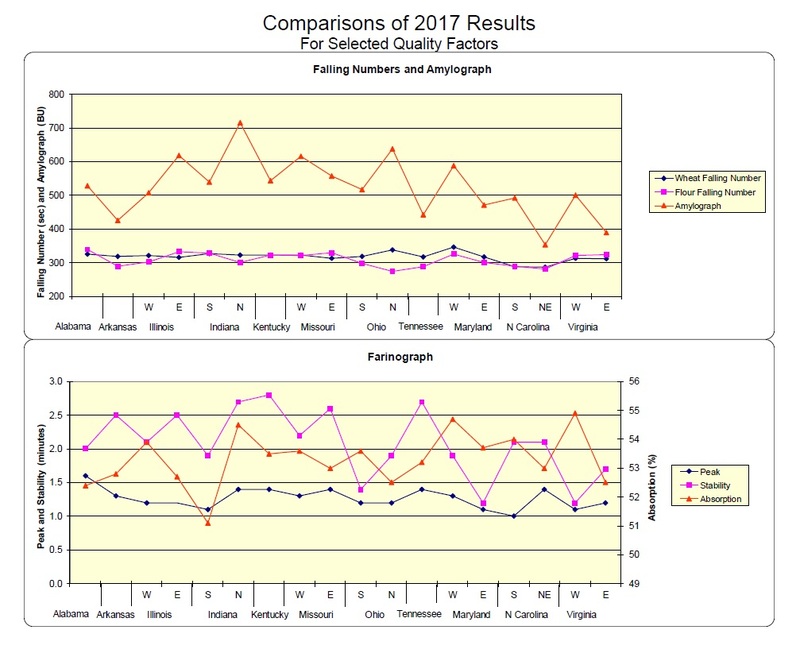 The Gulf Port average of 59.2lb/bu is similar to the 2016 average and above the five-year average of 58.6 lb/bu. 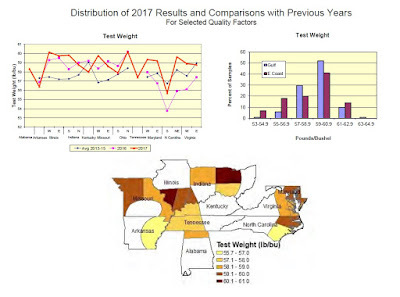 The East Coast test weight average of 58.6 lb/bu is above both last year and the five-year average. The Gulf dockage value of 0.3% is lower than any recorded in the previous five years. 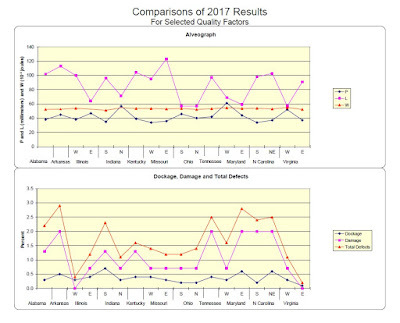 Other grade factors as well as moisture and dockage for both areas are similar to or better than the five-year averages. slightly below the five-year average of 9.8%. The 2017 East Coast and Gulf Port protein averages are similar. 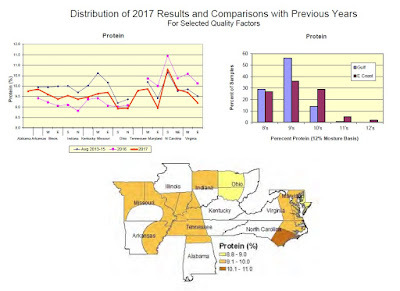 However, the East Coast average protein of 9.4% is below the region’s 2016 and five-year averages, while the Gulf Port average of 9.5% is above the region’s 2016 average of 9.1% and slightly below its five-year average of 9.7%. 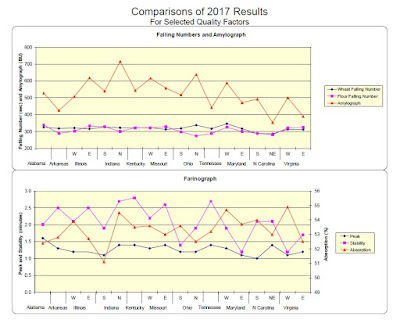 The Composite average falling number of 319 seconds is below 2016 but above the five-year average and indicates a generally sound crop. Fewer than 20% of samples had a falling number below 300 seconds in 2017, and only 4 of 270 were below 250 seconds. 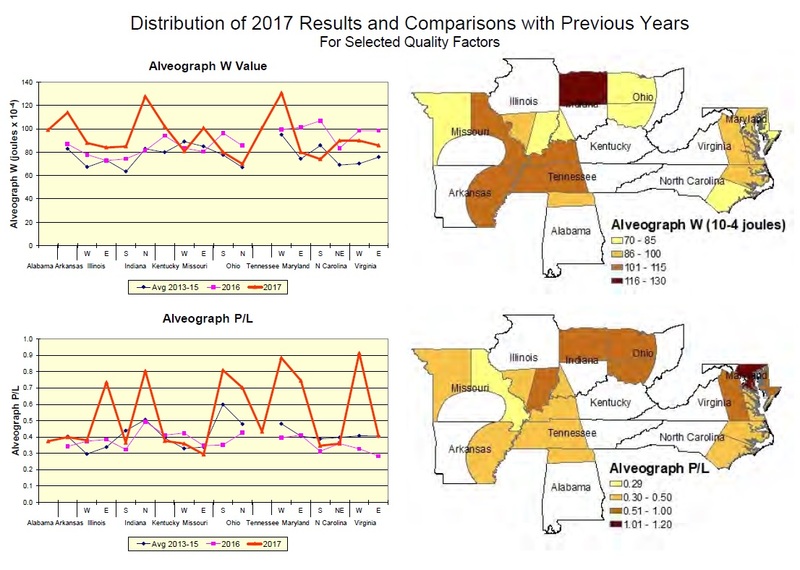 The Composite DON average of 0.4 ppm is below the 2016 value of 0.6 ppm and well below the five-year average of 1.3 ppm, indicating that the crop sampled is relatively free of DON. The East Coast value of 0.8 ppm and the Gulf Port value of 0.3 ppm are both below last year’s values and five-year averages. 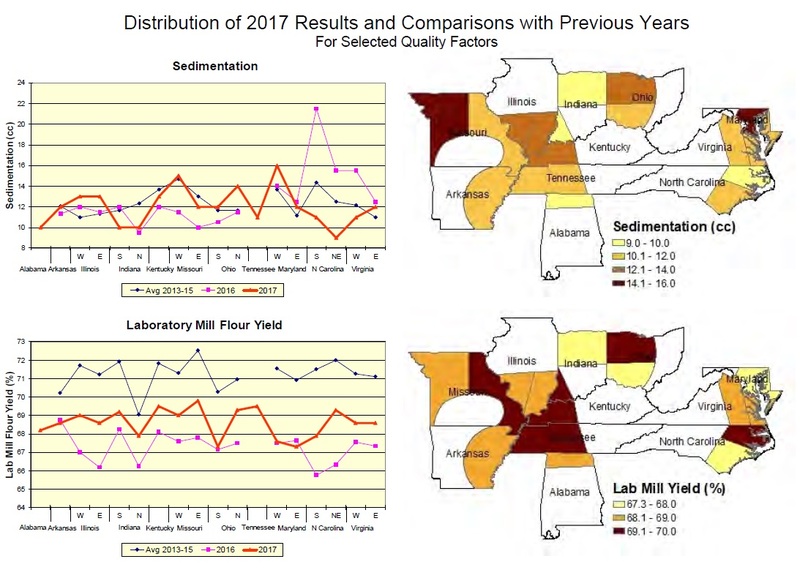 Flour and Baking Data: The Composite, East Coast and Gulf Port Buhler laboratory mill flour extraction averages are above 2016 but below the five-year averages. 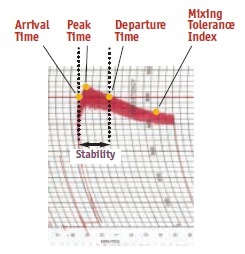 The Composite farinograph peak and absorption values are similar to five-year averages, but the stability value of 2.2 min is slightly shorter than last year and the five-year average. 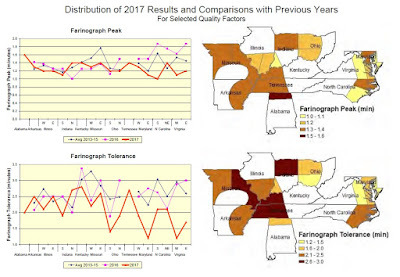 The Gulf Port peak and stability averages of 1.3 min and 2.4 min, respectively, are similar to last year and the five-year averages, while the East Coast peak and stability values of 1.2 min and 1.7 min are both shorter than last year and the five-year averages. 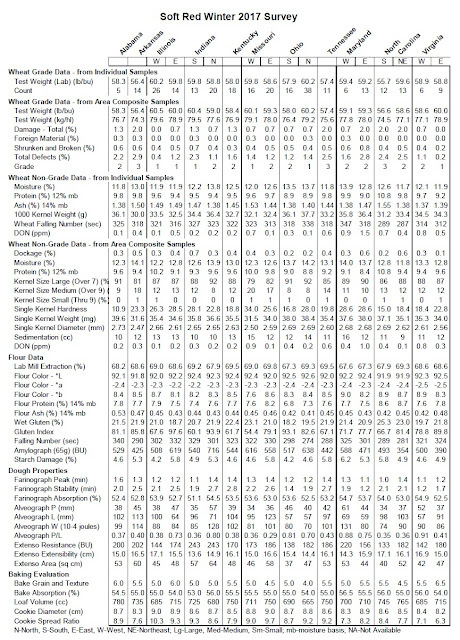 The Composite and Gulf Port alveograph W values of 92 and 93, respectively, are higher than the five-year averages of 80 and 79. 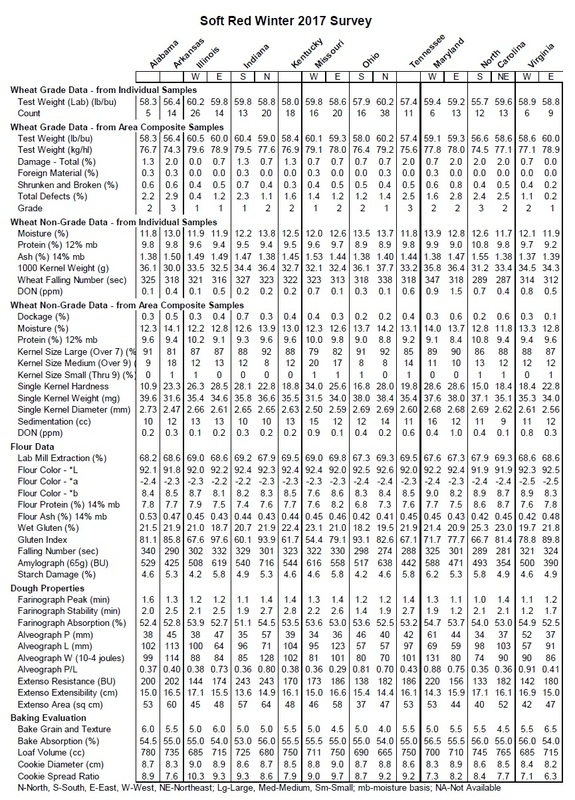 The other Composite, East Coast and Gulf Port alveograph values are all similar to the respective five-year averages given the variability of alveograph analysis. 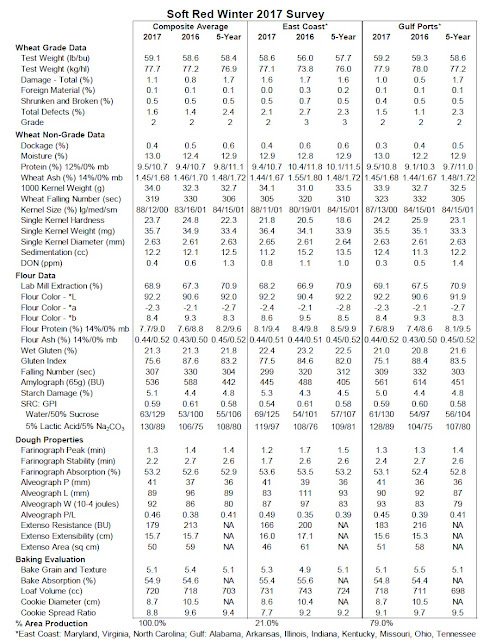 The Composite and Gulf Port cookie spread ratios are lower than last year and the five-year averages. 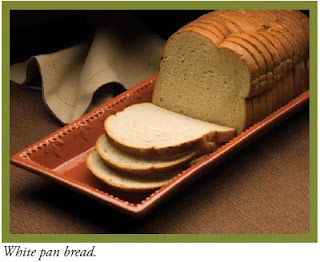 Average loaf volumes are all similar to last year and the five-year averages. 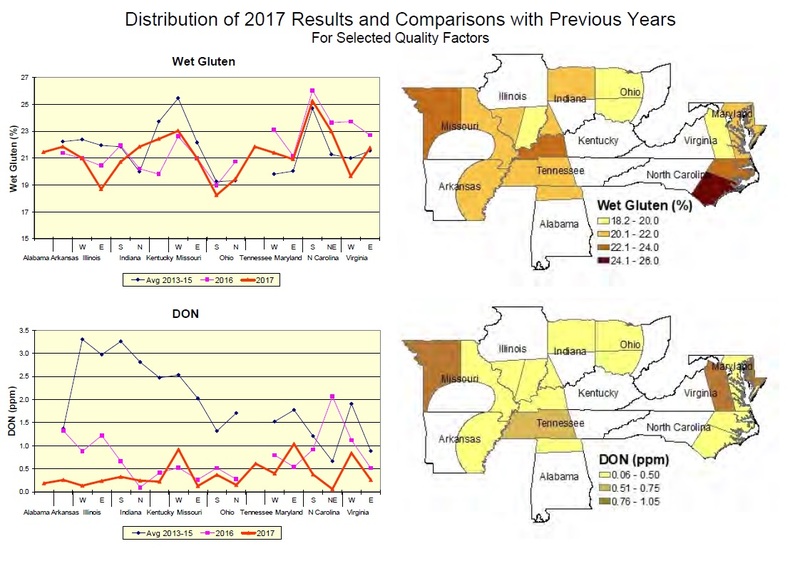 Summary: Although reduced planted area decreased 2017 SRW production, the crop had generally favorable growing season and harvest conditions for both East Coast and Gulf Port states. 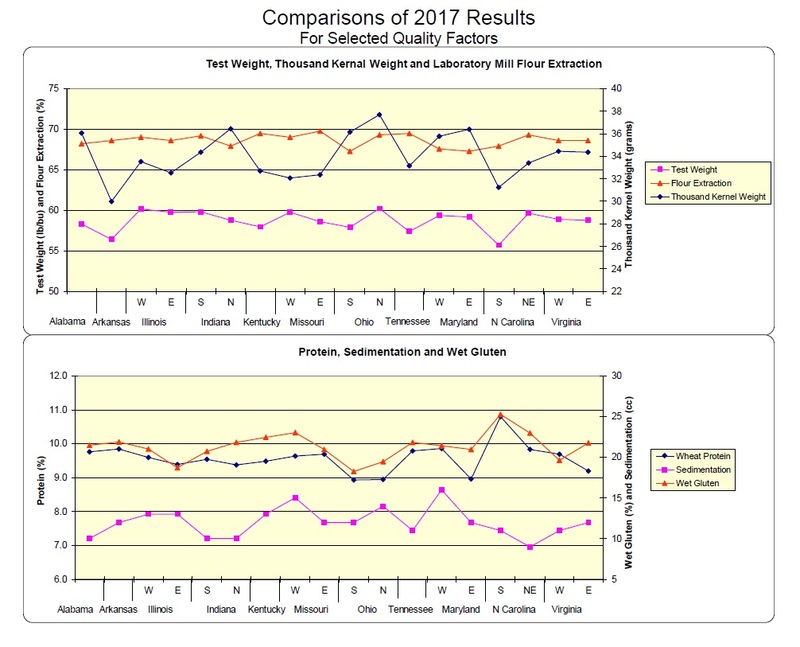 Test weight is well above average and dockage is below average. 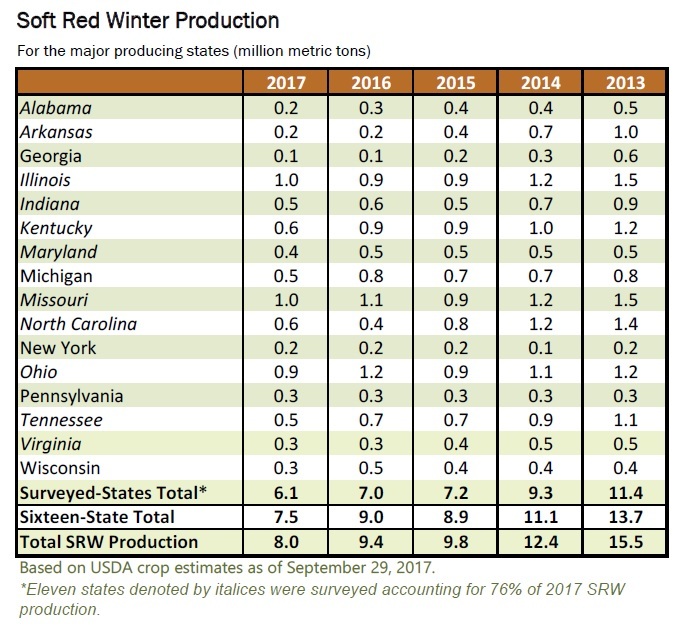 The entire crop in the states sampled is largely free of sprout damage, and DON values are all below last year and the five-year averages. Buyers are encouraged to review their quality specifications to ensure that their purchases meet their expectations. This survey was funded by U.S. 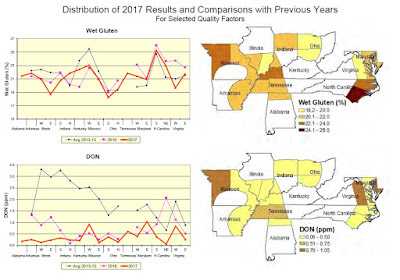 Wheat Associates and USDA’s Foreign Agricultural Service. About U.S. Wheat Associates: U.S. Wheat Associates (USW) is the industry’s market development organization working in more than 100 countries. Its mission is to “develop, maintain, and expand international markets to enhance the profitability of U.S. wheat producers and their customers.” USW activities are funded by producer checkoff dollars managed by 17 state wheat commissions and through cost-share USDA Foreign Agricultural Service market development programs. 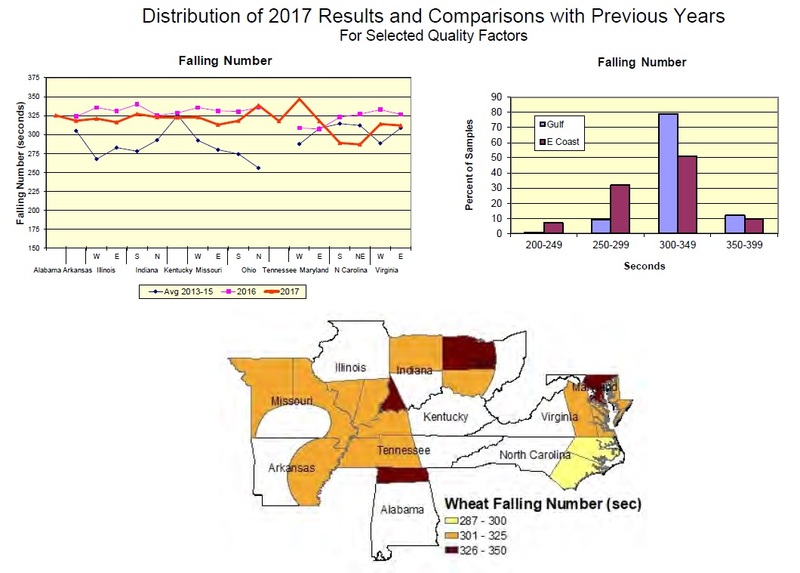 For more information, visit www.uswheat.org or contact your state wheat commission. Nondiscrimination and Alternate Means of Communications: USW prohibits discrimination in all its programs and activities on the basis of race, color, religion, national origin, gender, marital or family status, age, disability, political beliefs or sexual orientation. Persons with disabilities who require alternative means for communication of program information (Braille, large print, audiotape, etc.) should contact USW at 202-463- 0999 (TDD/TTY - 800-877-8339, or from outside the U.S., 605-331-4923). To file a complaint of discrimination, write to Vice President of Finance, USW, 3103 10th Street, North, Arlington, VA 22201, or call 202-463-0999. USW is an equal opportunity provider and employer.